MIT graduates Adetayo Bamiduro and Chinedu Azodoh have created a business in Lagos that will employ Nigerians and deliver goods in less than three hours! In the US, countless purchases are made online and shipped door to door relatively easily, but in places without zip codes and organization, like Nigeria, the process is infinitely more complicated. About 50 percent of package deliveries in Nigeria are late. The e-commerce industry has grown substantially in Africa, but many parts of the cities aren’t mapped out on GPS, so delivery from the e-commerce transportation hub to the customer’s doorstep, or “last-mile delivery”, slows down the whole process. Bamiduro and Azodoh created Metro Africa Xpress (MAX), an app to help deliveries reach customers faster. The app connects motorcyclists to e-commerce companies, and eases the last mile delivery with a combination of Google maps data and the motorcyclists’ street savvy. These drivers are called “MAX Delivery Champions”, and as of March, the team of 23 has delivered an average of 150 packages a day in Lagos, delivering everything from passports to clothes to $200,000 in cash. Some of these “champions” are married with kids. Some are migrants who fled other parts of Nigeria from the terrorist group, Boko Haram. 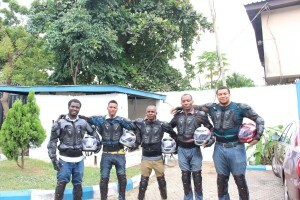 All of them are paid twice the salary of any motorcycle dispatch service in Lagos, $200 a month or more. Bamiduro and Azodoh have presented MAX as a commercial enterprise to investors, but they say they see it as a social impact company, as they try to reduce Nigeria’s high youth unemployment rate. Many of their drivers are receiving money directly into a bank account for the first time. As a Midwestern girl, Josie enjoys living in the plains, but would love to travel the globe, already having spent several months abroad during her studies in Austria. After graduating, she spends much of her time reading, writing, walking, running, dancing, and living! Josie would love nothing more than to empower others to be able to do the same.